10km – should be 1/10 as hard as 100km, right? 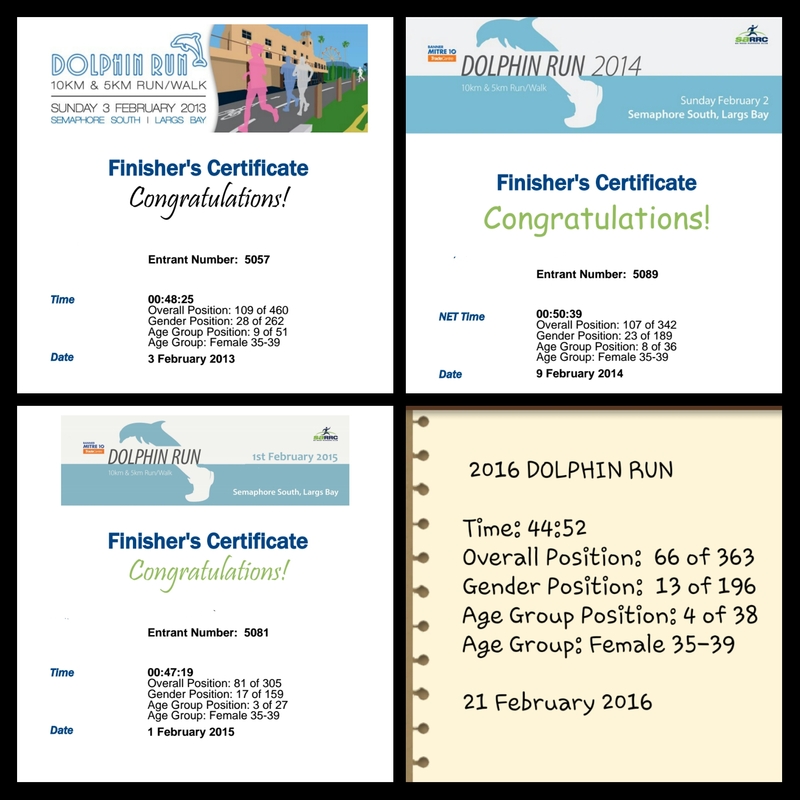 Yesterday was my 4th Dolphin Run, traditionally the first SARRC (South Australian Road Runners Club) event each year, in beachside Semaphore. In 2013 it was my first 10km race, just under 3 months after I started running. It remains the only 10km race I’ve ever run! 10km is not my favourite distance, possibly because I rarely race it! It’s funny because 3 of my regular weekly runs are usually around that distance, so I should be pretty used to it by now! But I guess those runs are usually at a more ‘leisurely’ pace, and of course also involve stopping, either for a drink or for traffic lights. I run 5km almost every week at parkrun, so I am very comfortable with that distance. I like the half marathon distance. More recently I have decided I like 1500m! And of course I am a recent convert to ultramarathon distances. But 10km? Meh! Prior to yesterday’s event, my fastest 10k was 42:27. That was during last year’s City-Bay 12k. Probably all downhill. That is a good indicator of what I can do on a good day but I wasn’t counting that as a 10k PB. As far as I was concerned, my 10k PB was my fastest 10k race, which was the corresponding race last year – 47:19. This year, I was aiming for sub-45 minutes. I thought that was achievable. After all, my last proper parkrun hit-out, a week after the 100km, was 22 minutes flat. Plus the Dolphin Run course is very flat and Torrens parkrun is undulating. My first Dolphin Run was 48:10. I was very happy with that – my aim had been to break 50 minutes. The following year I naturally wanted to go faster, however running the last 3km into a strong headwind put paid to that! Last year I managed that elusive PB, but I knew I could take a fair chunk off that time this year. I hadn’t run much during the week. Wednesday night’s annual 20km Pub Run had aggravated my left hip that had given me some trouble during the 100km. I blame the hills, not the refreshing cider I had at the halfway point of the aptly-named Pub Run! I had skipped my Thursday run (also because I wanted a sleep-in after a late night, having hit a Fringe comedy show after the run) and opted for an easy walk on Friday morning. Knowing that I can’t do an ‘easy’ parkrun unless I am pacing one of my parents, and neither of them were coming, I gave Saturday’s parkrun a miss too. I didn’t get to Semaphore quite as early as I would have liked, so had to park about 600m away from the start. That was not such a bad thing, as it meant I could do an easy warmup ‘jog’ from the car to the start! Immediately my hip started complaining, and I thought “Hmmm, this PB might not be happening today!” However, by the time I finished my warmup it had settled down a bit and I was good to go! People I’d spoken to during the week, when they found out I was running the 10k, said “Oh, that should be a walk in the park for you!” – meaning that anything should be easy after a 100k! Well, I wasn’t so sure about that, and it turned out I was right. This 10k felt SO much harder than the 100! I had my pace alerts on my Garmin set for 4:15-4:30, so if I fell outside that range my watch would let me know. My first km was 4:15. That was a little too fast. Thankfully there was no breeze to speak of! That meant that the tougher ‘back half’ was not made tougher by a headwind. It still felt uphill though! Thankfully, my hip held out OK but the rest of me struggled! Once I got to the Palais Hotel I started to pick up the pace a little. That was only a few hundred metres from the finish line. I didn’t look at my watch except when it vibrated at me. Thankfully at this point it was telling me I was going FASTER than the pace range I’d set, not slower as it had been doing for much of the second half! I crossed the line officially in 44:52 – I was super happy with that! I chatted to Paul for a bit – we hadn’t actually met before but we have followed each other on Strava and Instagram for a while and we were already Facebook friends. He had been aiming for sub 44 and I had kept him in my sights after he passed me in the first half. I knew he was less than a minute ahead of me so that gave me confidence I could reach my goal. As it turned out, he didn’t quite reach his goal but he wasn’t far off! I also chatted with Rachael, another Instagram friend who I hadn’t really ever spoken to before, although I had scanned her barcode at parkrun a few times! It seems weird that I would say a 100km is easier than a 10, but it’s true! Sure, I don’t expect to lose any toenails as a result of this race, and I am able to walk normally today, but I think it’s the significantly faster pace that makes the difference. At the pace I ran the 100k, it felt (relatively) comfortable. There was nothing comfortable about yesterday’s race! I reckon if I’d slowed down more in the 100k I might have felt like I could go on even longer! Also, in the 100k there were frequent stops and walk breaks. I never ran 10k non-stop during the 100. I didn’t stop in yesterday’s run – didn’t even grab a cup of water from the drink station. So I guess that’s it for 10k races until this time next year!